Zero Dark Thirty is, of course, an important story to tell. I kind of enjoyed the movie, but its importance may actually be the reason I couldn't help but feel a little let down. Because it's so important, director Kathryn Bigelow seems to have felt the need to allow the film to unfold very slowly over nearly three semi-painful hours. There is suspense, but at the expense of often feeling like a slog and American duty to make it all the way to the end. And the end is what everyone no doubt wants to stay for. Although the scene in which Osama bin Laden is killed in his Pakistan compound is lengthy, I felt like I didn't learn much that I hadn't already read about and the bin Laden sighting ends up being a brief flash. Having this as an episode of America's Most Wanted (that show's not on anymore, is it?) or Bill Kurtis Presents might have been more illuminating than this movie. And another thing. Jessica Chastain as Maya, the CIA agent who obsesses about her lead in the case to find bin Laden, is really not much of an actress. I expected a little more from someone who won the best-actress-in-a-drama award at the Golden Globes. She leads a cast that turns in a mostly made-for-TV-level performance. 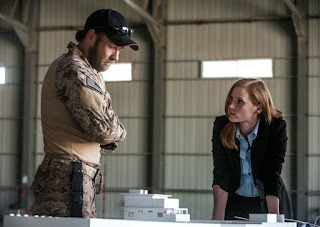 Zero Dark Thirty is probably the most overrated film I've seen in a long time.